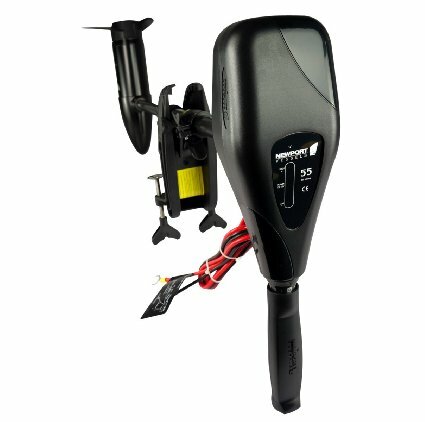 How well your boat performs will depend on several different components; 0ne is the battery that you have powering it. 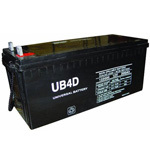 You want the battery capable of handling the marine environment. However, in order to have the best battery setup, you also need the best fuses. Every good fuse block needs a distribution block if you want fewer wires. To learn more about this aspect, read our Marine Power Distribution Block review below. What is a Distribution Block Used For? 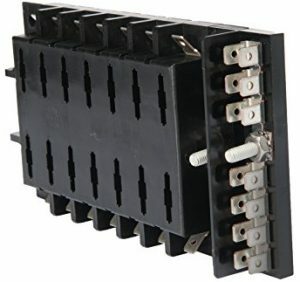 A marine terminal block works alongside a marine bus bar and becomes a convenient way of distributing the electrical currents from a single fuse to several different devices at one time. 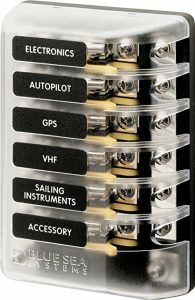 This makes fuses easier on the battery and you will have fewer wires running to every device on your boat. Lastly, distribution blocks are safer and more reliable than simply having a fuse exposed to the elements. What is the Difference between Distribution Block and Fuse Block? 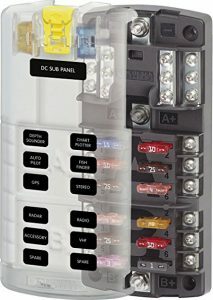 Simply put, a fuse box holds separate fuses so that you can power multiple devices at one time. A distribution block will make it possible to control all of the devices using fewer fuses. In the marine environment, the fewer wires and connections you have, the more reliable your electrical system will become. That is why so many say that they are ideal for boats. 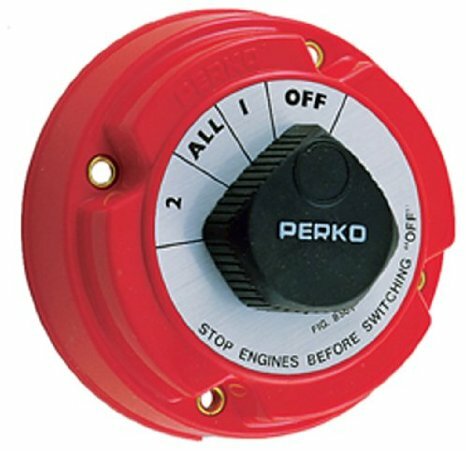 When upgrading your boat’s wiring, you will want to mount the marine fuse box close to the battery switch. If you don’t have a switch, you may want to get one as it will kill the power going out from your battery when it is not being used. You may also want to draw out a wiring diagram to guide you on where to put all of your wires. Then you hook up your busbar with the fuses before running your main wires out to the equipment you have on board. To show you the type of distribution blocks you may want, you should take a look at the ones below. They are popular choices and promise to get the job done by most reviewers. This fuse block provides two isolated groups of six ATO/ATC circuits. It is usable with either two isolated batteries or a single battery and provides a mix of 24-hour and switched circuits. It uses tin-plated and copper buses as well as fuse clips. There is a clear insulating cover with label recesses and a storage area for two extra fuses. Fuses are sold separately. This fuse block has a negative bus and cover. It is easy to label, holds extra fuses, and allows you to remove fuses easily when they need to be replaced. You can use large format labels to ensure you can see the writing easily and all conductive parts are insulated. It has a 30 Ampere rating on each circuit. This fuse block has plenty of space for multiple fuses. It has more space than other types of fuse blocks and can be used for a wide number of applications. 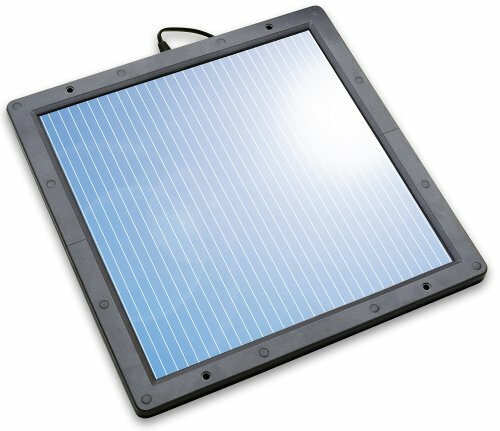 There are people who use this on boats and some that use it for solar setups. This marine terminal block has an average rating of 4.6-stars. It is a 6 gang terminal block that combines both positive and negative in one block. It is a brass terminal bar and has 12 screw terminals. Owners use it for boating uses, exterior wires and lighting around their home.